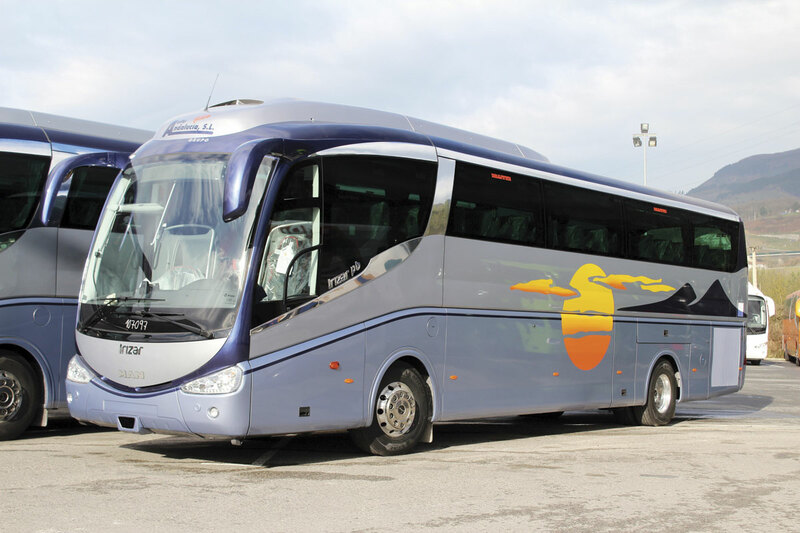 With Neoplan’s decision to drop the Starliner coupled with Daimler’s earlier decision to discontinue sales of the Setra family in the UK and Van Hool currently dominating the small sector at the peak of the market it is perhaps the ideal time for Irizar to launch a new flagship coach range in the UK. The left hand drive i8 Integral was unveiled in dramatic style with dancers, singers, acrobats and musicians at last year’s Busworld Kortrijk exhibition, and is a ground up new development that follows established Irizar design cues while incorporating the latest design and manufacturing techniques to make it both safer and more economic to operate than its predecessors. To be offered in both integral and body on chassis formats, the i8 will replace the tremendously successful PB range which has been around for 15 years now and has never lost the considerable wow factor that in its youth helped win it the International Coach of the Year title. 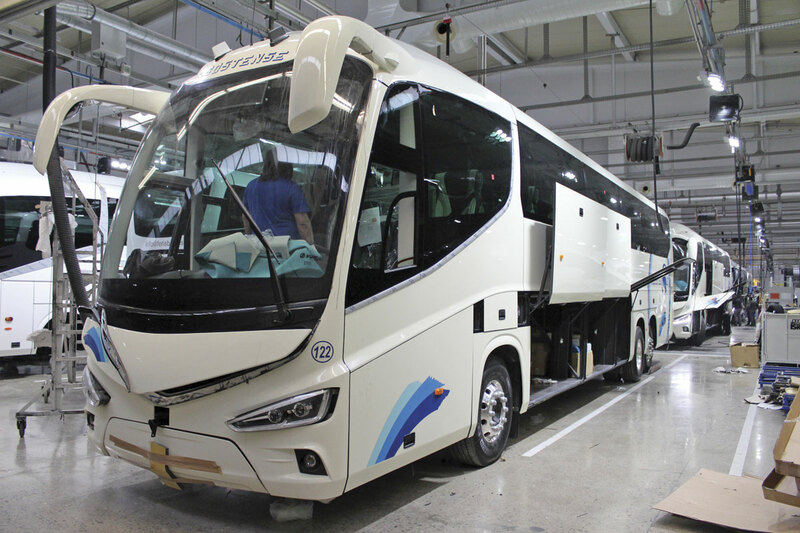 To introduce operators to the i8, but also to give potential customers the chance to see the plant where Irizar builds all coaches destined for the UK, Irizar UK invited operators to join their team on a visit to Spain last week. A large number of operators took up the offer and with representatives of the press added to that 84 of us met up in the Basque country for a three day visit that mixed business with Irizar’s renowned hospitality. Designed in conjunction with Arup Design Research (ADR), the PB set a high standard in terms of flair and customer comfort but 15 years is a long time in vehicle design and both market expectations and Irizar itself have moved on a long way. The PB was not designed simply to be a flagship in the way that the i8 is, it was originally intended to replace the Century in the Irizar range and it was offered in a variety of heights, lengths and specification levels to meet a myriad uses. In the interim the i4 and i6 models have emerged bringing with them enhanced finish and quality standards while retaining and refining the adventurous styling to gain a crisper look. 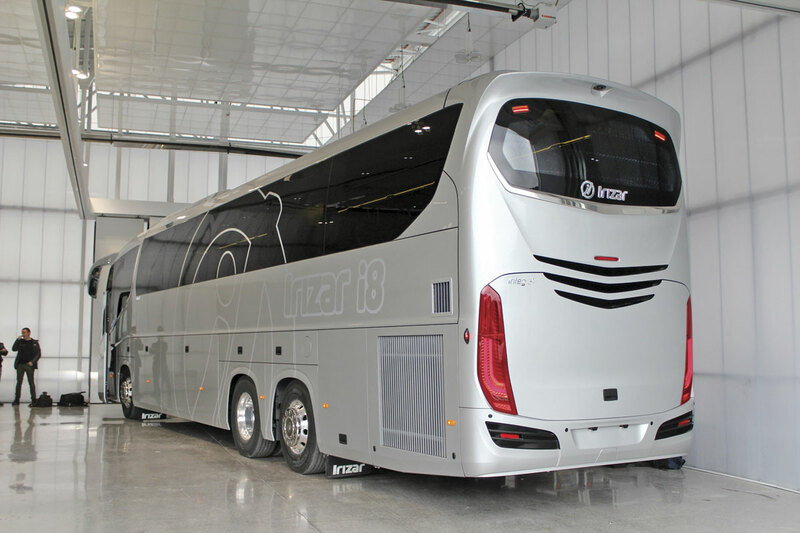 Irizar initially only offered body products in the UK on other manufacturer’s chassis, for the past two decades those of Scania, but over the last five years the company’s revised ambitions have seen it transform to become a complete vehicle builder rather than simply a coachbuilder. With this have come DAF-powered fully integral versions of the i4, i6 and even the PB, though only two integral PBs have been supplied. Now they are being joined by the i8. Such has the success of the i6 been, that it has captured much of the market once the preserve of the PB, as well as of the Century, and thus it is a much smaller market sector that the i8 is targeting. We are almost certainly never going to see large fleets of i8s because Irizar’s aim with the product is that it will appeal to the very top of the market and the specifications and options offered will reflect this. For a start there is only one height option, 3.80m (or 3.98m over the air conditioning unit), which is as high as you can go in most of Europe. Length will, initially at least, be limited to two options in right hand drive; 13.22m and 14.07m and all versions will be mounted on three axles, though I’ve a feeling that Irizar may have something up its sleeve for the day when 19.5tonnes becomes permissible on two axles. Irizar publicity material shows a two-axle 12.4m coach and also a three axle 14.98m coach. All variants have the same 2.69m front overhang but the rear overhangs differ, as does the main wheelbase, though the distance between the second and third axles is always 1.5m. On the 13.22m the main wheelbase is 6.82m and the rear overhang is 2.985m, while the 14.07m has a shorter 6.37m main wheelbase but a longer 3.545m rear overhang. Developed at a cost of ¤20m of which half was specifically for the i8 and half for systems that will be carried over to other models, the i8 is Irizar’s most advanced product yet, hence the launch slogan, ‘a unique technological masterpiece’. At first glance you might mistake it for a PB but look a little harder and you quickly realise that though there are similarities and the bulbous front dome has been re-profiled and retained, absolutely nothing is the same as it was on the PB or even the i6. The front door aperture is wider to create more space in the entrance area. Gone are the unusual indents running the length of the side body panelling replaced by a more practical but still stylish feature line that follows the upper edge of the side locker doors, dipping just nearer the front than the (thinner) sloping main feature pillar. 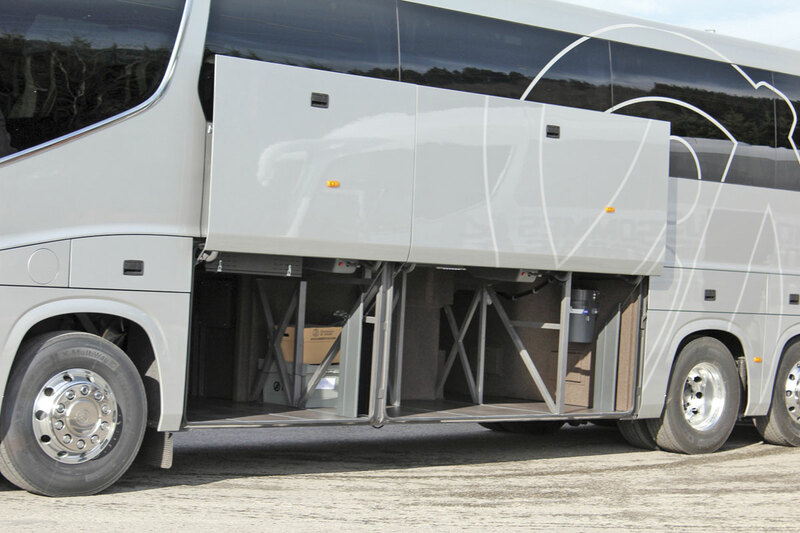 The stainless steel front and rear sections are both new and unmistakably Irizar. The front incorporates a shallow V effect rather than the elliptical smile of the i6 and a contoured upper screen edge with integrated marker lights, the shaping of which is most evident on bodies finished in a light colour. 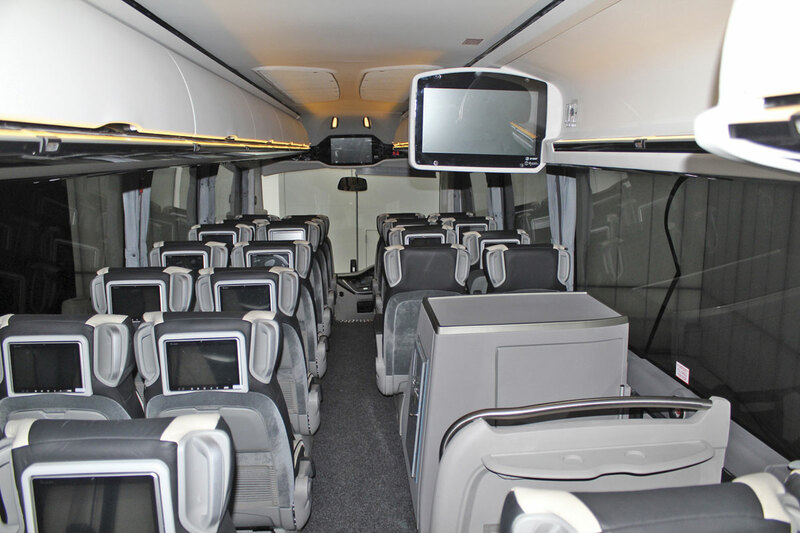 LED headlamps are used, and all other lighting on the coach also employs LEDs. A criticism often levelled at the PB was that it lacked luggage space compared with some of its rivals. This won’t be an issue with the i8, which provides 13.5cubic metres in the 14.07m model. The flat floor ensures there is additional capacity of 0.8cubic metres over and above that provided by the i6. 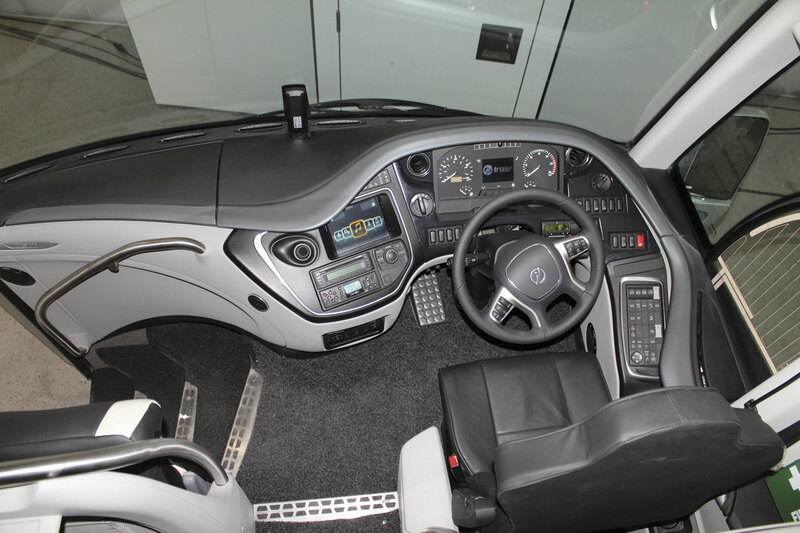 Standard features of the body include a driver’s bunk, Spheros pre-heater, aircraft style lockers, black VG7 ultra-tinted double glazed side windows, automatically activated light and rain sensors and, in what Irizar claims is a first, an MMI integrated multi media system built into the dash with command joystick and integrated touch screen. At the front of the saloon there is a built in 22inch Actia TFT monitor with a second 18.5inch unit built in above the mid mounted toilet compartment. Two different height mid sunken toilet options are offered and also, on the longer 14.07m coach, a rear saloon mounted option. Bosch provide the Professional Line audio system as well as the DVD system and Actia a reversing camera. The seats are a key area that sets the i8 apart from the i6 which is itself now offered with a new i6+ seat. 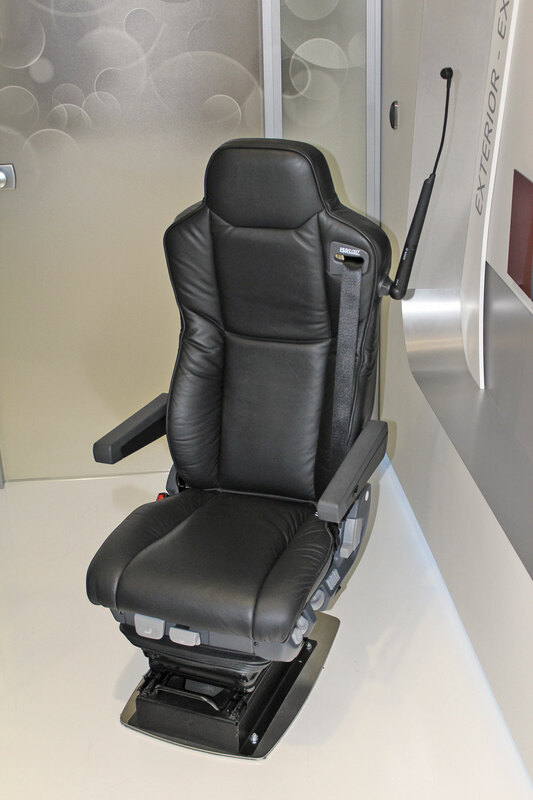 For the i8, the newly developed and attractively shaped seats offer luxury appropriate to the market positioning. Magazine nets, seatback tables, optional three point comfort belts, side displacement and armrests are all offered along with optional USB charging boxes and top end entertainment systems including seatback screens with their attendant on-demand content. I-Leather piping is standard and there are a choice of trim materials including new flat weaves and even an exclusive perforated leather design. Two standard seat trim application styles are offered, named Horizontal and Vertical, with Vertical being the more modern and Horizontal the more traditional, though if you want something different it can be specified. Importantly, you will not be able to specify the i8 style seats in the i6 in the way that you could specify PB seats in the i6 and neither will the special trims be transferable. 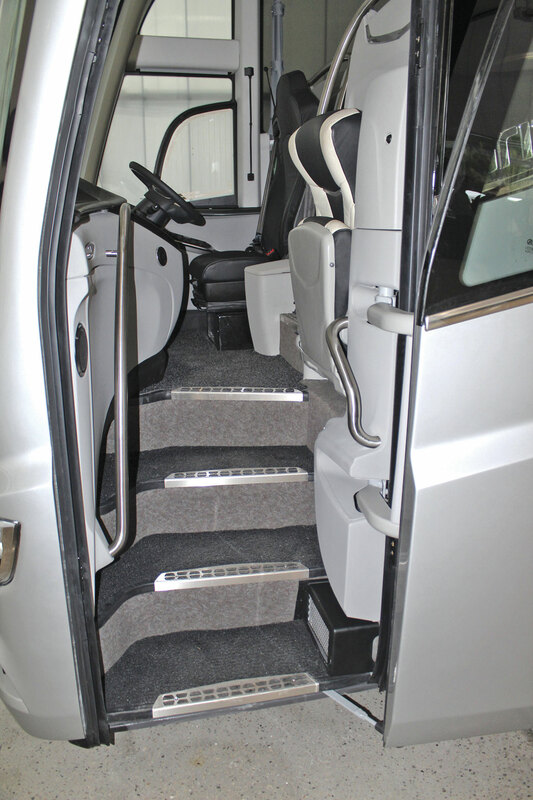 Seating capacities to UK specifications would allow a maximum of 61 or even 63 with the low toilet option in the 14.07m and up to 57 with the higher toilet, while the 13.2m will offer 53 plus toilet. The 57 and 53 seat options are expected to be the most popular based on experience of the i6, though a good many i8s are expected to have bespoke interiors for football work and 1+1 or 2+1 layouts present no issues. Naturally, specialised component companies within the group supply their products including the Masats electric front and centre doors, the latter with retractable step, and the Hispacold bi-zone climate control system with eCo3 air purification. Mechanically, the i8 will only be offered with the 13-litre DAF MX13 common rail engine which can be supplied with either of two outputs. The smaller is the MX13.340 which generates 460hp/340kW at 1,450-1,700rpm and peak torque of 2,300Nm at 1,000-1,450rpm. The larger MX13.375 unit takes the power up to 510hp/375kW and the torque up to 2,500Nm. Both options employ SCR, EGR and a DPF filter. Oil change intervals have been extended to 100,000km. Initially, the only transmission option will be the 12-speed ZF AS-Tronic 2300 automated manual. This will be followed later this year by the fully automatic ZF EcoLife gearbox but as this can currently only handle torque of up to 2,300Nm it will only be offered with the 460hp unit and not the 510hp. Other aspects of the mechanical specification include ZF axles all round. The front independent system and the tag axle both use the RL82EC while the drive axle is the AV132 with a 2.93:1 ratio differential. The suspension and braking system is by Wabco with features including ECAS/EBS3, AEBS, ABS, ASR and ESP. The ventilated discs and callipers are by Knorr-Bremse (who also supply the tyre pressure monitoring system) and there are Koni shock absorbers and Vibracoustic air bellows. The steering is by ZF and VSE, the diesel tank holds 470-litres and the AdBlue tank 40-litres, the multiplex system is the Continental VDO-KYBES 24v system and the wheels are Alcoa Durabright Black Tags. Safety systems at the disposal of the driver include: adaptive cruise control (ACC), lane departure warning (LDW), driver fatigue detector (DFD) and the advanced emergency braking system (AEBS). Retail prices for a standard high specification will be from £295,000 for the 13.2m coach and from £299,000 for the 14.07m although those equipped for football club applications are likely to come out at considerably more if a lot of options are added, such as the seatback multi channel video systems fitted on the coach we were shown. An initial batch of seven right hand drive i8s is either built or in an advanced stage of construction. Ellisons Coaches (Gavin Murray) have ordered two, Clarkes of London one and Stewarts Coaches one, all of which will be used on high profile football club contracts carrying leading teams. Another has been sold to a customer that wishes to remain anonymous for the time being, the coach we saw will be the UK demonstration vehicle and there is one stock vehicle currently available. More stock i8 coaches will be available from March onwards. Sales Director, Ian Hall told me he anticipated that around 20 i8s would be sold in the UK this year. 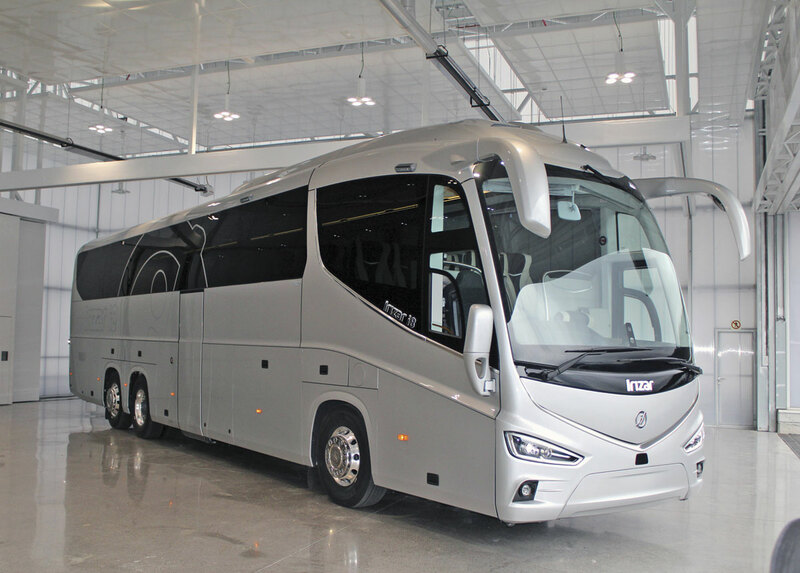 Unfortunately, we did not get to travel on an i8 but there was the opportunity to inspect a 14.07m long right hand drive example in the customer delivery centre and showroom that Irizar built a couple of years ago at the Ormaiztegui site. This was complete except that it had the final two rows of seats omitted, presumably for the installation of a rear servery/kitchen. We look forward to experiencing the on road characteristics when the first examples arrive in the UK, which shouldn’t be very long now. 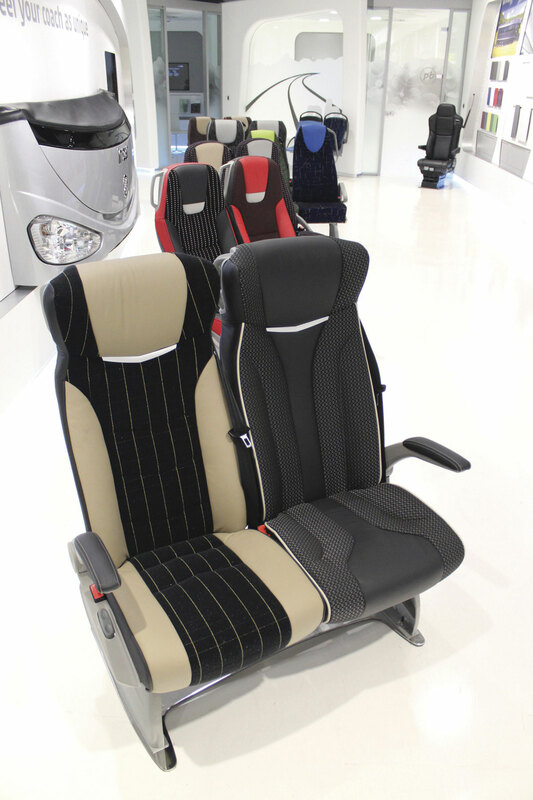 The driver’s area certainly appears well thought out and the very well appointed seats comfortable. The feature window pillar is considerably narrower than the one I often criticised on the PB. About the only criticism I could make during a brief walk through was that the 18inch television which is fixed above the toilet compartment may protrude a little too far as I managed to bash my head on it and it wasn’t very forgiving. Peter Godward Coaches are based near Basildon and in the last two years have bought three Irizar integrals including two i6s (one 57seat/12.9m and one 61seat/14m) and one of only two PB integrals in the UK. Speaking to Peter and John Godward they said, ‘It’s very nice, not that much different to the i6 other than at the front and back. We’re pleased with the ones we’ve got and we’d buy again because we like the Irizar product.’ A reservation they had was what it would cost to get the specification they wanted because they had been told that the leather seat trim on the coach displayed was an additional £5,000 and specifying televisions in the seat backs was around £40,000. 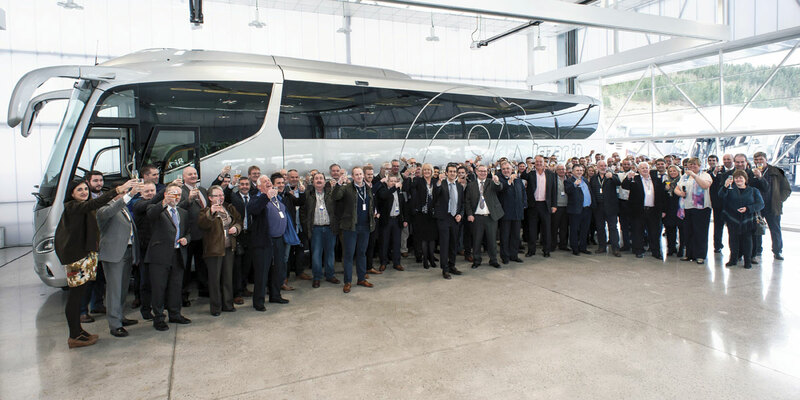 I have been round the Irizar plant on quite a number of previous occasions and seen it grow as the company has developed, but for many of the party it was the first time they had ever been to Irizar’s global headquarters and they were understandably impressed. The UK is Irizar’s biggest market for the integral coach product accounting for 30% of total integral sales, a situation that may well be challenged in future years as following the limited introduction of integrals in Spain during 2015 they have already grown to represent 15% of integral sales. Quite a number for Spanish operators were to be seen going through the factory. Irizar has optimised the steels used in the i8 frame for weight and strength reasons and it already meets the forthcoming ECE R66.02 rollover requirements. I was told at Kortrijk that the longer i8 integrals weigh around a tonne less that the same body on a chassis. As on other Irizar models, it is possible to specify stainless steel for the frame for a premium (which I understand is around £5,000). Irizar UK aren’t anticipating much demand for the stainless steel option; only Martin Spiller’s Centurion Travel have ever taken it up for the i6 and they didn’t bother when they placed a repeat order. Construction takes places on six long lines in the main plant, starting with the preparation of the chassis (for chassis mounted vehicles) and the assembly of the framework, the sections of which are produced by contractors and brought in. Complete roof sections with all fittings and trim already in place, including the video systems, are constructed down the road in a facility once used to manufacture coach frames and mounted on the frames which proceed through the various construction, protection and painting phases until they arrive in the finishing area. At present all i8 integrals go down the same line within the plant and it was evident that their construction is increasing because we saw what we were told was the 52nd i8 built so far in one of the workshops. It is easy to see which vehicles are integrally constructed and which chassis mounted because the integrals go through the plant on small wheeled trolley skids. Once the integral bodies are complete, they are carefully transferred to a plant a couple of kilometres up the road where they enter a small facility that has been operating since 2011. Here, they pass backwards through three bays where all of the mechanical items are fitted and then undergo a variety of tests as they pass back down a parallel line ready for delivery. We were not only shown the factory but also the offices and customer receptions areas including the livery design centre. We also saw the headquarters of Creatio, a separate company within the Irizar Group that undertakes all research and development work, ensuring that the different elements of development are properly focused. Two i2e electric buses are being operated by Go Ahead in London on behalf of TfL. 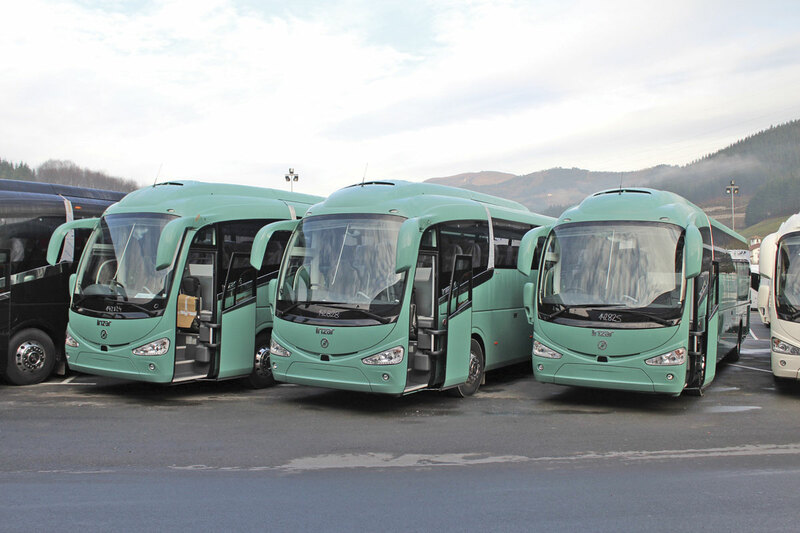 Irizar, which focuses its bus development on fully electric buses, currently has similar vehicles operating in a number of European cities including nearby San Sebastian, though it has not yet received a major order for the model. To date around 20 i2es have been built. The lack of a major order is not a major concern because it is not yet in a position to handle such a requirement. A couple of factory units along from the integral finishing plant is another unit where the i2e electric bus is built at a current rate of one bus a month with all current capacity allocated. This is a temporary arrangement as a new bus plant is now under construction close to San Sebastian which should be completed by the year end. Speaking to Gotzon Gomez, Irizar Export Director, he was clear that the future for electric buses was dependent on political funding to encourage their widespread adoption. He saw batteries as the challenge. He confirmed that there would be an articulated version of the i2e but declined to say when. 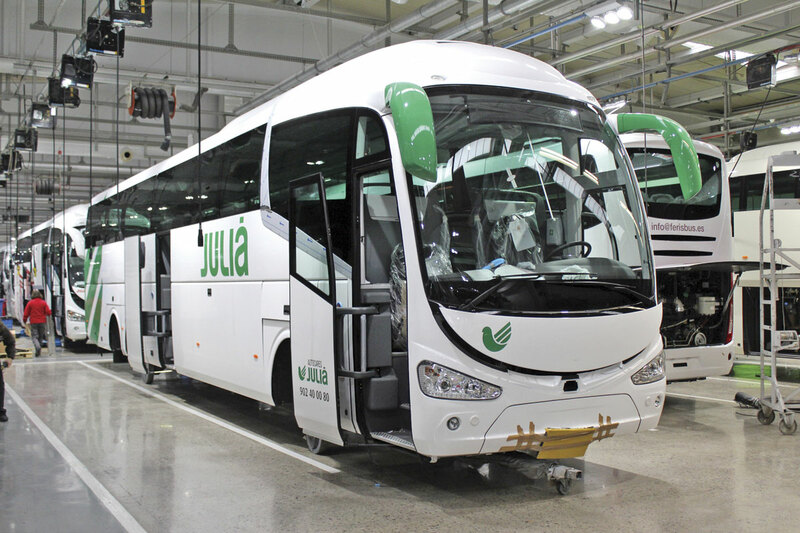 Irizar, through its Jema subsidiary, can also supply the charging infrastructure for electric buses, as well as producing the electrical propulsion systems themselves. In addition to the i2e, Irizar produces a fully integral version of the i3 bus (as well as chassis mounted versions) and has previously said it will build a hybrid Class 2 bus, though no diesel parallel hybrids are expected to be available this year. Part of Irizar UK’s role is to look after integral bus sales as well as those of coaches, but Gotzon was clear that, beyond the electric, he did not see scope for diesel integral low floor bus sales in the UK because operators wanted under 12m narrow buses without double glazing and without air conditioning and Irizar could not compete with that product. ‘Irizar does not make a cheap bus,’ he said. Steve O’Neill has enough operating experience to know what operators are accustomed to getting from manufacturers in terms of support for their vehicles and also what they would like. Under him, the company is investing to ensure that the support network provides what is needed. What has been developed is a three pronged system with the DAF network at the heart of it. 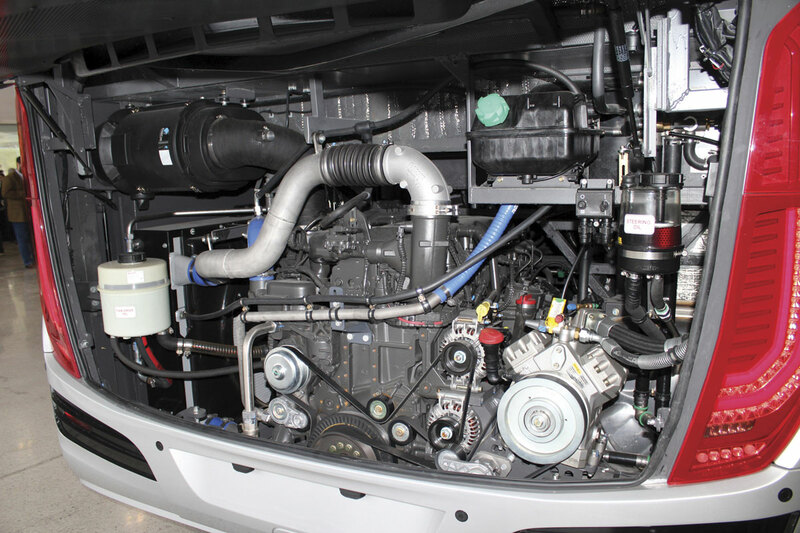 All Irizar integral vehicles have DAF/Paccar engines. Their dealerships provide support for the mechanical aspects of the vehicle with Irizar UK spending time providing additional product training to upskill DAF technicians at key dealerships. 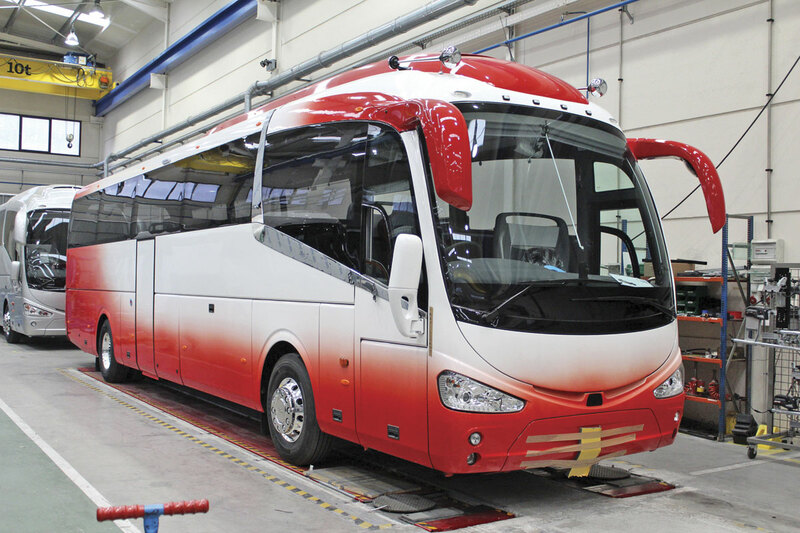 Inevitably, faults will arise from time to time with aspects of the coach that are not driveline related and when this happens Irizar UK will either send out a local specialist to handle the problem or one of its own skilled men in vans who can undertake work at an operator’s premises or wherever else they are needed. Ian Hall commented that Irizar UK was one of very few dealerships to offer warranty provision in an operators own premises. Three vans are on the road at present, piloted (makes them sound like Thunderbirds) by Steve Bass, Darren Bradshaw and Jon Clark. If more mobile engineers become necessary they will be appointed. Appointed in 2015 and now firmly at the helm of the support side is UK Aftercare Manager, Andy Mageer, who many Volvo operators may know from his time with Thomas Hardie. 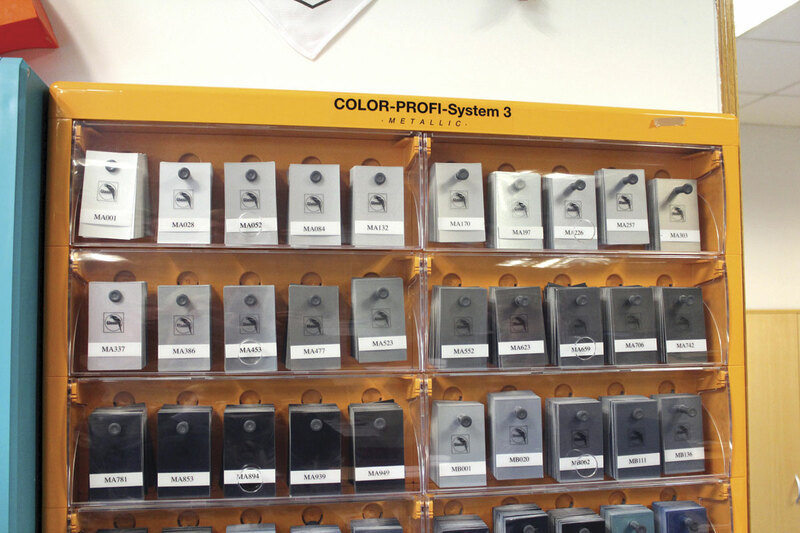 Parts support is handled through Masterpart at Worksop and this will continue. Not only is Irizar UK investing in support, it is investing elsewhere to bring in the people it needs to continue driving the business forward. A key new recruit is Alison Prince was has joined from Mellor where she has been for many years selling predominantly to the local authority and community transport markets. Alison has taken the role of Sales Account Manager North, handling sales in the north, an area that will be extended to include Scotland which is currently being managed by Sales Director, Ian Hall. The Southern part of the UK will continue to be handled by Julie Hartley in her wider role as Business Development Manager. Newly appointed to look after sales support functions as Sales Support Coordinator is Katie Woolhouse, who has extensive sales experience in the past. She will be working from the Worksop headquarters. 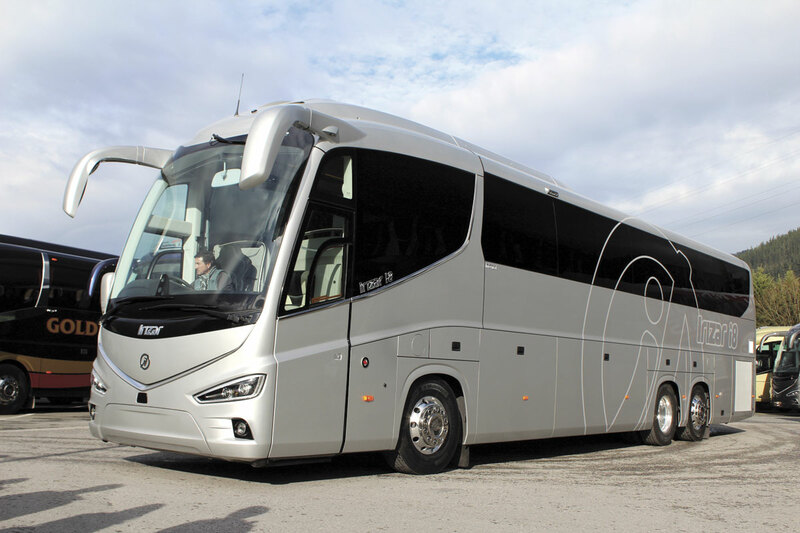 Their appointments bring the Irizar UK total to 14 people and it is likely that this number will increase further as the company plans to continue expanding. Announced during the visit were Irizar UK’s plans to build new £3.5m premises on a site within five miles of their existing headquarters at Worksop in Nottinghamshire. The deal has not yet been signed off but will give the company a showroom large enough to display two vehicles, a five bay workshop and coach parking for up to 120 vehicles. Such a massive investment is evidence of the company’s long term commitment to the UK market as well as its determination to increase its share within it. 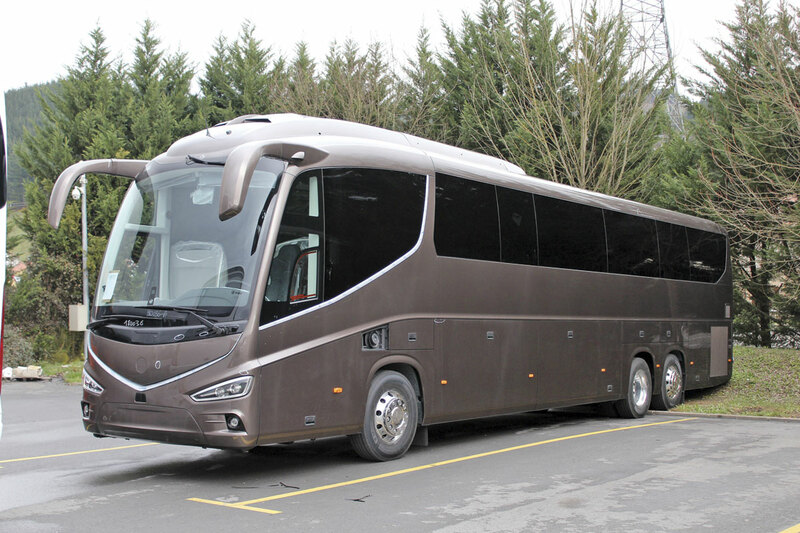 The move comes as Irizar UK celebrates having passed the 200 integral sales mark since the business commenced in 2011. Last year sales reached 78 vehicles if the two i2e electric buses for TfL are included. Apart from six i4s (2 x 70 seats, 4 x 55 seats) all were i6 models including four of the short length 10.8m variant. The others i6s sold were 12.2m, 12.9m, 13.2m, 13.8m or 14.07m. The 13.8m length option has now been discontinued. No additional 10.8m stock has been ordered for 2016 though one will shortly be delivered to Weardale and there is an existing stock vehicle available. Steve O’Neill revealed that new higher capacity versions of the i4 integral are being developed with an offside rear parachute door rather than a full second door. 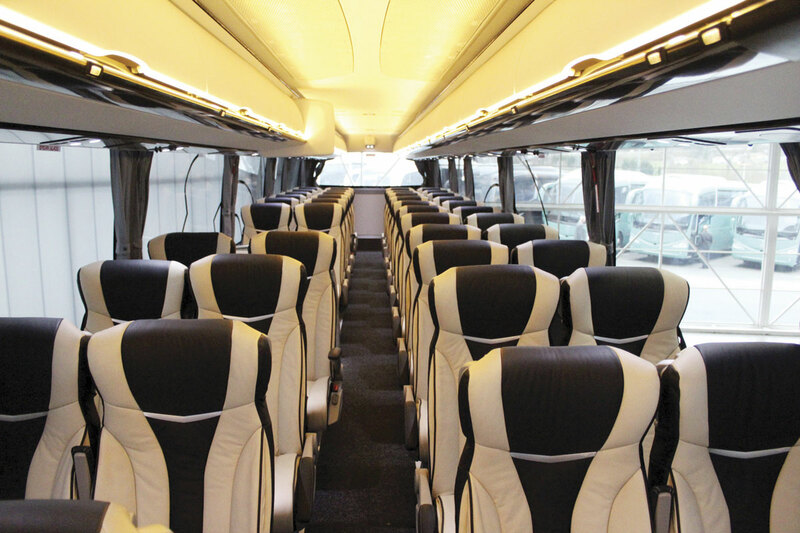 This will enable 70 seats to be offered in a 12.2m i4 or at least 73 and possibly 75 in a 12.9m coach. Stock 70 seaters will be available. In a speech Ian Hall had said that there would be ‘other new products on the horizon’. However, in a subsequent meeting with Gotzon Gomez, he said that Irizar was now offering the widest range in its history with the i2e, i3, i4, i6, i8 and for certain markets the Century, adding, ‘I think this portfolio is enough’. From a standing start five years ago Irizar has achieved great things with its integral product range and this year expects that over 25% of the growing number of vehicles built at its Spanish plants will be of integral manufacture. Currently production is running at 1.5 integral coaches per working day (217 days), a production rate that is set to be reviewed at Easter but should equate to well over 300 by the year end. Launching the i8 and providing an enhanced range should contribute to that number increasing in future years. Irizar UK anticipate a UK sales split whereby the i8 will account for between 20-30% of sales with a target of 20 in the first full year. My gut feel is that the 20% figure will be difficult to exceed which is not intended as a criticism of the i8 or a feeling that it has any shortcomings, rather that the i6 is such a good package that value conscious operators will probably consider that it continues to meet the requirement for all but the very best paying coaching work and most demanding customers.